2017 Cruse Wine Company, Monkey Jacket, North Coast. 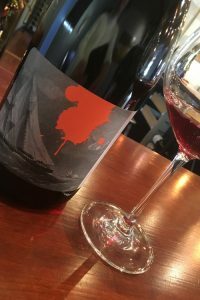 A unique inter-regional blend of black grapes, Cruse Wine Co.’s 2017 Monkey Jacket is a cuvee of Valdiguié, Carignan and Tannat, a truly eccentric wine that intrigues with a play of darkness and light with a juicy center holding the two sides together, it is a fun and mysterious red that has some exotic spicy tones, fruit, spice, hints of earth and supple tastiness. The Cruse Monkey Jacket has a feel that reminds me of the Southwest of France, like Fronton with it’s Negrette like feel and juicy/earth/spice combo, and it makes for an interesting quaffer. Cruse is more known for his super sparkling wine in both traditional method and his Pet-Nats, but this latest vintage of red wine releases have impressed, especially his Carignan and Valdiquie bottlings, along with this one that combines both Carignan and Valdiquie as well as having the rare Tannat grape added to the mix. The lighter ruby/garnet color and freshness helps curb some of the earthy/savory funkiness that provides the complex background and its more medium weight and lower alcohol make it easy to drink, it benefits also from a slight chill as a Beaujolais does. Plum, wild cherry, strawberry and blueberry fruits lead on the vibrant palate before that groove of pepper, minty herb, truffle/earthy and game comes out along with a hint of dried flowers and touch of cayenne.